It’s no secret that I love everything about Autumn. The weather has cooled off, the ground is covered in beautiful golden leaves but still it’s not quiiite cold enough to dig out the wooly hats and winter coats just yet. It’s my absolute favourite time of year to spend plenty of family time in the great outdoors. Just because the Summer is over it definitely doesn’t mean I’m ready to say goodbye to the days spent frolicking in the garden any time soon! Our Sunday was spent playing croquet in the in laws garden before enjoying an amazing roast dinner at the pub down the road. It was such a lovely relaxed day and the perfect way to welcome Autumn. Nothing makes my heart happier than simple days spent with my loved ones. Bella loved getting stuck in, insisting on using an adult sized mallet that was bigger than her and chasing her ball through the hoops. I don’t think she quite understood the rules as there was a lot of hand balling going down by a certain almost three year old… The dogs also thought they would get involved by laying in front of the hoops we were trying to hit the ball through! Have you ever played croquet before? What’s your favourite garden games? I’d love to know! 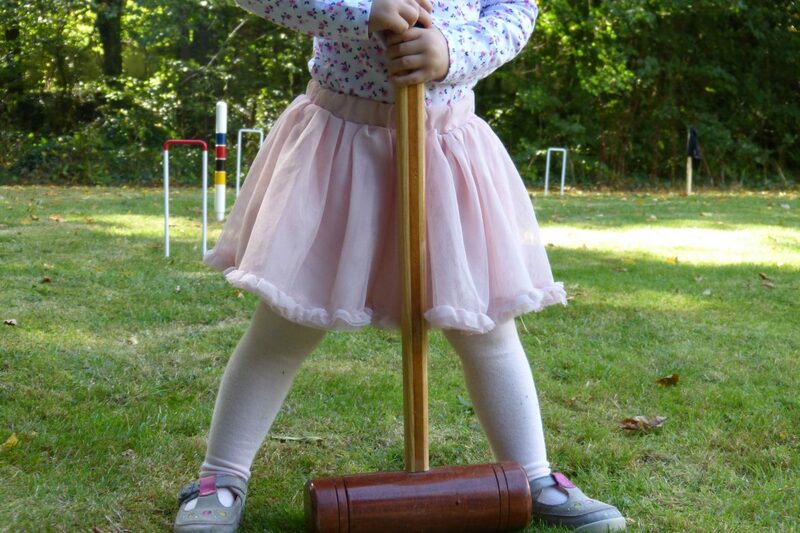 I love croquet! And that’s such a beautiful set you were gifted. Something you can enjoy for years to come! That looks like a beautifully made set that will last for a lifetime. We had a croquet set that every family gathering/cookout we’d break it out. That thing was OLD. Keep at it, it gets more fun as the years go on. Also, those ballerina flats are super cute! Looks like you all had fun! Gorgeous photos! I’m so useless at games like this, doesn’t stop me trying though! Yay to your blogs fb page too! Never played croquet before. Must be an English game. I haven’t seen people playing it in Ireland before. We don’t really play any games in the garden but my all time favourite is boule.